I looked down the line of dads holding their little ones all pumped or terrified to meet the man in the red suit, and giggled. He was right. Almost all of them were sporting the same abdominal ‘curvature’ as my dear partner in life and parenting. A dad gut isn’t pronounced like a beer gut but it’s still noticeable. Then we made another observation. Almost all the other guys at the shopping centre around the same age who didn’t have kids hanging off them clearly didn’t have one. I also thought about our dad friend who despite running marathons sports a subtle daddy tummy. So I wondered, is dad gut a thing and if so, why does it happen? So, I did a little research and this is what I discovered. It probably doesn’t come as a surprise to learn on average a dad-to-be will pack on an extra couple of kilos (at least) before his baby even arrives. Then after the birth, it can go even further south for him, compared to guys of a similar age without kids who actually lose weight, according to a study. What is surprising is why this happens in the first place. If your partner started to look a little pregnant alongside you while you were both waiting to meet your little one, he may have been experiencing couvade syndrome, otherwise known as a sympathetic pregnancy. It is now believed over 30 per cent of dads-to-be experience this strange phenomenon, whereby they experience some of the same pregnancy symptoms as their partner. These might include food cravings, morning sickness, fatigue and also weight gain. In the lead up to becoming dads, and about six months after the birth of their baby, something very cool happens to the brains of dads. Not only does their testosterone levels drop by about 20 to 30 percent, making them more mellow, they also experience a rise in oxytocin. Oxytocin is the hormone responsible for turning your hairy fella into a ball of mush around his baby. It is the bonding hormone and also the reason he has become so fiercely protective of his little love. Then of course there’s the big dumb obvious reasons behind new daddy (and mum) weight gain: lack of sleep and time to exercise away from the family. Any parent of young kids knows how debilitating chronic sleep deprivation is to our ability to get out and do the things we used to do. This coupled with the fact that babies and young kids are adorable little time zappers means going for a jog, a gym session or even having the energy to walk down the road to get milk may not happen as much or as regularly as they used. In fact, one study found that men who sleep less than 7 hours a night have a higher BMI than those who sleep 9 hours each night. And I know what you’re thinking – seven hours would be nice! What’s more, having disrupted and stolen sleep also plays havoc with our metabolism, so it really isn’t any surprise that our men are a little more cuddly after kids. Who doesn’t indulge in a glass of wine and chocolate when the kids have finally gone to sleep? Add birthday parties, convenience food (because we are all exhausted), snacking and fussy kid food into the mix and bad diet is another kilo creep factor. We all know that weight gain is problematic to our health and we want our kids’ fathers to be around always, but the good news is, you can help your man with his dad gut by making some lifestyle changes. A dad gut doesn’t need to progress and if you can stop it from getting any bigger he’ll have more energy to cope with the stress of parenting and life. Give each other the gift of sleep: Prioritise getting to bed early (switch off the TV once the kids are in bed) and tag team naps on the weekend or sleep when the baby does. 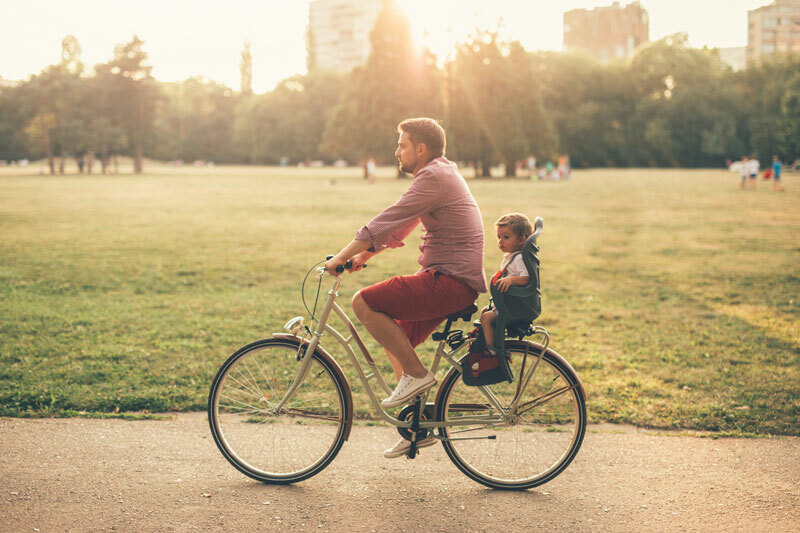 Get him active with your little ones: Get him a baby seat for his bike, raise the pram handle to be dad height and encourage him to go on pram walks with bub, strap the baby into a carrier on him and go for bush walks, encourage him to play chasing with the kids, you get the idea. Get him eating better: Think about portion sizes, banish naughty snack foods from your pantry and fill your fridge with more vegetables and pantry with nutritious food. Drink only water: Several studies suggest that weight loss can be enhanced by increasing water intake, especially if he has a glass 30 minutes before a meal. Other drinks like soft drink, juice and beer won’t do his dad gut any favours.